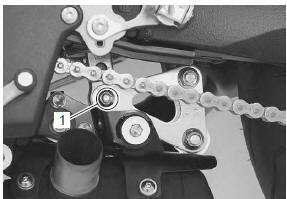 Support the motorcycle with a jack to relieve load on the rear shock absorber. Remove the rear shock absorber lower mounting bolt and nut (1). 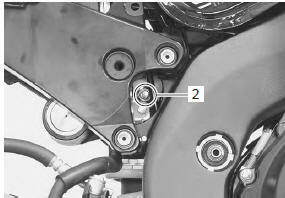 Remove the rear shock absorber upper mounting bolt and nut (2). tighten the rear shock absorber upper/lower mounting bolts and nuts. Install the left muffler and muffler chamber heat guard no. 2. Refer to “muffler / muffler chamber / exhaust pipe removal and installation” in section 1k . 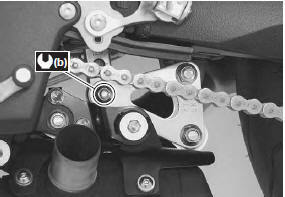 Refer to “rear suspension inspection” in section 0b .